NASA is developing a mission that would perform dozens of flybys of the ocean-harboring Jupiter moon Europa. NASA's highly anticipated mission to the potentially life-supporting Jupiter moon Europa may not get off the ground until the late 2020s, agency officials say. Last year, Congress granted NASA $175 million to continue developing its Europa mission, which will perform dozens of flybys to gauge the life-hosting potential of the icy moon's huge subsurface ocean. 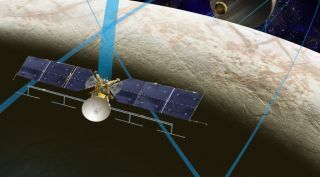 Getting the Europa flyby spacecraft ready to launch by 2022 would probably require a 2017 investment of about $194 million (out of a total NASA budget request of $19.03 billion), Radzanowski said. The space agency has provided this estimate to Congress, he added. "Within our $19 billion request, to find an additional $150 million — whether within the science portfolio or abroad — we felt would upset the balance of the overall portfolio," Radzanowski said. "So we do not think it's prudent to support a 2022 launch at the funding level requested." Scientists regard Europa as one of the solar system's best bets to host life beyond Earth. The moon's vast ocean — which harbors more water than all of Earth's seas combined — is in contact with Europa's rocky mantle, making possible all sorts of interesting chemical reactions, researchers say. So astrobiologists are eager to explore Europa — and they're not the only ones. Congress shares this enthusiasm, in large part because of John Culberson (R-TX), who chairs the House of Representatives' Appropriations Subcommittee on Commerce, Justice, Science, and Related Agencies, and has a longstanding interest in the search for alien life. It's too soon to know exactly what's going to happen with the Europa mission, which is still in the early-development phase. For example, Congress may end up giving NASA far more for the project than the $49.6 million it requested this year, bringing a 2022 liftoff back into the realm of possibility. In fact, that will probably happen, if precedent is any indication. NASA didn't ask for any Europa-mission funding in 2013 or 2014 but ended up getting more than $120 million for those two years combined. And in 2015 and 2016, NASA requested a total of $45 million for the Europa project, and Congress allocated $275 million.